Precious metals futures advanced for a third straight session Tuesday. Gold gained the most, closing at its best price in seven months. Gold for August delivery tacked on $14.80, or 1.2%, to finish at $1,297.50 an ounce on the Comex division of the New York Mercantile Exchange. The settlement is the highest since Nov. 4. "Bullish charts, a weak U.S. dollar and safe-haven demand are all working in favor of the gold market bulls, at present," Jim Wyckoff, a senior analyst at Kitco Metals Inc., said in a report. "There is some risk aversion in the marketplace this week, ahead of potentially markets-moving happenings later this week. Such is benefiting safe-haven gold, as well as U.S. Treasuries and the Japanese yen," Wyckoff added. 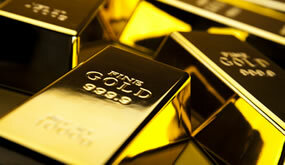 Gold futures ranged from a low of $1,282.10 to a high of $1,298.80. They climbed 0.2% in the previous session. Elsewhere, silver for July delivery settled up 12.9 cents, or 0.7%, to $17.71 an ounce. The settlement is the strongest since April 24. Silver futures traded between $17.51 and $17.75. They rose 0.3% in their start to the week on Monday. July platinum added $5.70, or 0.6%, to $963.30 an ounce, ranging from $953.30 to $969.50. Palladium for September delivery gained $6.55, or 0.8%, to $848.40 an ounce, trading between $837.30 and $853. Gold bounced $13.55, or 1.1%, to $1,293.50 an ounce. Silver added 4 cents, or 0.2%, to $17.56 an ounce. U.S. Mint bullion sales were unchanged as of 4:21 p.m. ET. Below is a sales breakdown of U.S. bullion products with columns listing the number of coins sold during varying periods. Products with an asterisk (*) are no longer available.